Wow, has it really been 2 weeks since I've posted some ramblings on here? I wish I had a good reason, such as having a vacation to some exotic locale, but unfortunately its just been a case of real life busyness. Anna had a school athletics carnival last week that I had to sew a plain green tshirt for her to wear because it turns out to be impossible to find one to buy when I needed one. Luckily kids clothes don't take too long to make! I volunteered to help coordinate on the day and I was in charge of the sack races - I tell you after a day of herding small children into sacks larger than they are for many races I was as exhausted as if I was doing the jumping around! But it was a hot sunny winter's day and loads of fun. Anna's school also had a school fete as their major fundraising activity which I also volunteered to help. I didn't actually make anything this year because so far I've kept my sewing talents a secret for fear of being inundated with requests, but I was still pretty busy on the day. We've also been painting and wallpapering our house to hopefully sell in a few months time, which has also required massive amounts of purging and decluttering. Practically every week I've taken several bags worth of stuff to the op shop and yet there is still more! Living here for 11 years has given us plenty of time to accumulate way too much stuff. Now to actually sew something from my stash instead of just giving it away! For many years sewing for me was a solitary hobby - I didn't know anyone that sewed and when I was younger I was in fact rather embarrassed to admit that I sewed my own clothes! Which is why it's really great these days that not only do I know loads of like-minded sewists in real life and on-line, but sewing isn't a solitary thing anymore since I sew with the lovely Australia Sewing Guild ladies which has been immensely helpful in expanding my skills and shop with the Sydney Spoolettes (for which I need no assistance or encouragement but it is fun sharing the guilt!). Nor am I embarrassed anymore to admit that I sew my own clothes either, in fact I'm rather proud to be part of this great community of creative and skilled people. 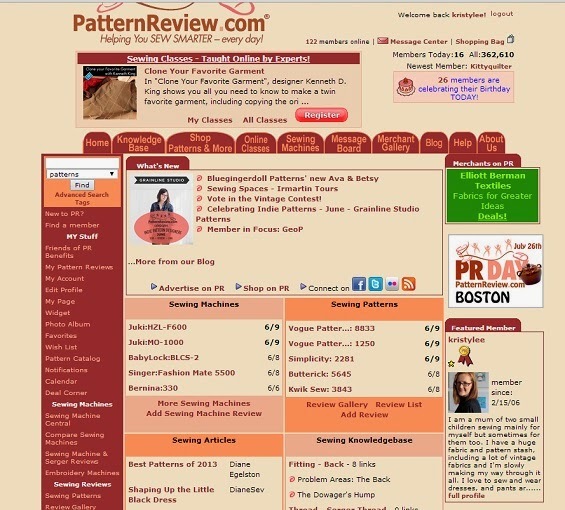 So it is extremely flattering to be recognised first in Burda Style magazine and now by Pattern Review as their current featured member. The Pattern Review thing came completely out of the blue and was really something I wasn't expecting - there are so many members doing wonderful things and I've really only been active in the last year after being a very slack member for many years. So thank you Pattern Review! Ok, enough showing off from me I think - on to my latest creation. Would you believe that until a few months ago I hadn't ever owned a piece of jungle print fabric or RTW garment or even an accessory? Even Anna managed to rock a leopard print faux fur jacket when she was just two years old! I bought this leopard print fabric from fabric.com back in March, and it is quite a stiff cotton, a bit like quilting fabric which is the perfect weight for a skirt. The fabric faded quite a lot after the first wash, which at first annoyed me, but now I think the faded, worn in look makes this skirt look a bit more casual and less va va voom which is what I traditionally think of when I think animal print. The pockets are nice and deep which is useful not only for standing around in a slouchy pose whilst taking photos of the side of the road while motorists drive past staring at you, but also for carrying all the bits and pieces that end up in the pockets of a mum to a little boy - rocks, feathers, snotty tissues and the like! So if you have this issue of Burda I can thoroughly recommend digging it out to make this skirt. It has the streamlined look of a pencil skirt with that added extra casualness and quirkiness of the angled pleats and deeply curved pockets on the side front. If you want to wear a pencil skirt style but don't want to feel like like you're wearing office wear, then this is the perfect skirt style. And happily I can report that we are now experiencing proper winter, albeit Sydney style - no frost, snow or extreme cold temperatures of course, but cold enough to finally get out some lovely wool and tweed and make some winter clothes. A few months ago I searched and searched for dark chambray fabric, which I ended up buying online from Fabric.com (with a few other pieces of fabric too). It arrived really quickly, and was the perfect colour, weight and stretchiness. So I cut out a shirt pattern really quickly. And then it sat in my sewing room, untouched. And then it sat some more for good measure. Sadly I have a tendency to do that sometimes. But I did manage to sew it up at my sewing weekend away - it's amazing how much you can get done when you're far far away from those time monopolisers otherwise known as children, husband and real life! Actually the first mistake occurred when I ordered this fabric - note to self when ordering fabric in the future: one yard of fabric is much less than one metre! I didn't order enough fabric to have any left to recut the yoke hence all the fiddling with it. But it turns out that losing some width in the yoke due to the unexpected seam in the centre helped get a great fit (seeing the good in the bad, people). I also didn't have enough fabric to cut out the cuffs, but since I usually wear my long sleeve shirts folded up to the elbow I figured I could leave off the cuffs and do a tab on the sleeve instead (seeing the good in the bad again). So I sewed the sleeve seams with a French seam because they would be visible - yay for me, taking care to make sure the inside is nicely finished for a change! But here comes another mistake - the sleeves are so narrow I can only just fold them up above my wrist to hide the fact there's no sleeve! I could unpick the beautiful French seams to let out the sleeve as much as possible but I'll probably just leave it as is. The sleeves are really long even without the cuffs, which I can see on the version that the model is wearing in the magazine photo. This is a simple dirndl skirt I made from some vintage cotton a long time ago (way back in 2010!) that I don't actually wear that often, so it was nice to wear it out while the autumn weather here was still doing its best impression of summer.